fromWND: Among the endorsers of this Green New Deal is Sen. Cory Booker, who compares the battle to stop climate change to fighting the Nazis in World War II. fromNBCNews: The two and a half year long Democratic Party witch hunt comes up snake eyes. fromLibertyPen/YouTube: Across the nation, the movement to ban plastic straws is gaining momentum. Tucker Carlson looks at the danger posed to Americans by this tubular menace. fromReason: A new record, but one that won't stand for long. fromWashingtonFreeBeacon: The latest clown to pile into the car says he "is vegan because eating eggs 'didn't align with my spirit'. fromNWI: In 1965, the court reasoned, “It can hardly be argued that students shed their constitutional rights to freedom of speech or expression at the schoolhouse gate.” What happened? fromTheRutherfordInstitute: We are approaching critical mass, the point at which all hell breaks loose. The government is pushing us ever closer to a constitutional crisis. fromArmstongEconomics: The government fines banks if its customers are caught doing wrong incentivizing the process of ditching customers who use cash instead of conveniently trackable credit cards. fromReason: The long-held judicial concept known as the presumption of innocence is now hopelessly out-of-style. At college campuses, it must take a back seat to #MeToo feelgoodism. fromWatchDog.Org: Ninety percent of public and private higher education institutions in the U.S. restrict the speech of their faculty and students, according to a new report produced by FIRE. fromZeroHedge: Nothing to see here! After Strzok was kicked off the special counsel investigation, Mueller's Records Officer scrubbed Strzok's iPhone after determining "it contained no substantive text messages." fromCreators: The Democratic Party's attack on charter schools. "Denying children what can be their one chance in life is a new low, even for politicians." If only children had as good of a union as the teachers. fromReason: Now the Falconers Are Suing. "I'm treated no differently from a common felon on parole." fromJudicialWatch: The Foreign Intelligence Surveillance courts rubber-stamped the Carter Page spy warrants without holding one hearing on these extraordinary requests to spy on the Trump team. fromForbes: "In short, we all need the First Amendment. We all need legal protection of our right to question and debate, without which democracy declines into stagnancy". fromReason: Politicians should not overrule doctors when it comes to pain control. The physician group says widespread "misapplication" of the guidelines is hurting patients. fromCreators: "Much of today's incivility and contempt for personal liberty has its roots on college campuses, and most of the uncivil and contemptuous are people with college backgrounds". fromFoxNews: A California politician advocates that people be judged as members of groups, not as individuals. fromReason: The ACLU has been proven to not give a damn about civil liberties unless it forwards a leftwing cause. fromCreators: The threat to our future lies in the fact that today's college students are tomorrow's teachers, professors, judges, attorneys, legislators and policymakers. fromVapingPost: Busybodies minding YOUR own business. fromLibertyPen/YouTube: Thomas Sowell explains the damage done by the welfare state mechanism. fromReason: The end game of the Russian hoax is taking shape. Plus: Testing telemedicine abortion and 3D printed guns. fromReason: We restrict trade to punish our enemies. Why would we do the same to ourselves? Are restrictions on opioids a threat to human rights? fromWashingtonPost: When government imposes regulations that make it near impossible for a physician to prescribe an essential medication, or for a pharmacist to stock the medication, that becomes a human rights issue..
fromCreators: It is a cowardly act for a professor to take advantage of student immaturity by indoctrinating pupils with his opinions before the students have developed the maturity and skill to examine other opinions. fromReason: A tired old drug warrior checks into rehab. fromMiamiHerald: Venezuela's inflation rate spiked from 4,966 percent to nearly 18,000 percent in just March and April — a trend that, if it continues, could push the country's annual rate to more than 100,000 percent. fromNewsbusters: The newest incarnation of CNN's anti-Trump fetish. fromPewTrusts: Nearly 300,000 people are held in state and federal prisons in the United States for drug-law violations, up from less than 25,000 in 1980. Why not private provision of many government services? fromFFF: There are a wide variety of tasks that the private sector could better provide that many think must be supplied by the government. fromReason: On trade, foreign policy, and so much more, he's Clinton, Bush, and Obama without the charm and respect. That can be a good thing. 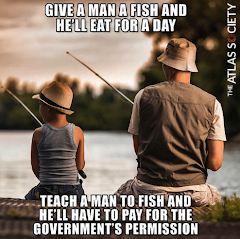 fromLearnLiberty/YouTube: What if the government can’t solve our problems because the government doesn’t really exist? Prof. Mike Munger explains his “unicorn” theory of the state. fromAmericanThinker: This is California, the canary that died to reveal to the rest of the country the final destination of arrogant liberalism and open borders. fromLibertyPen/YouTube: Tucker explains how politicians in California and Chicago have devised tactics to register illegal aliens as a central feature of their electoral strategy. fromTheWallStreeJournal: The European Commission will review an approach that led then-President George W. Bush to remove tariffs in previous dispute. fromForbes: If state action is deemed “unnecessary” to protect free speech--one of our most cherished civil liberties, if not the most cherished civil liberty—then one is hard-pressed to explain when it is ever necessary. fromTheFreeThoughtProject: An 84-year-old grandmother and holocaust survivor says her treatment by the TSA was so bad that even though she survived Auschwitz, she barely survived the TSA. of removing tariff-reduction from two-party politics. fromTheHill: Just because leftwing media channels are not supported by the free market doesn't mean taxpayers should have to do it. fromPolitiFact: Not much and yes, the feds can still bust you if they please. fromFoxNews: President Barack Obama delivered perhaps his harshest blow to constitutional freedom by permitting his attorney general to circumvent the Fourth Amendment. fromZeroHedge: Elon Musk’s ventures have reportedly vacuumed in around $5 billion in federal subsidies. He is clearly a government parasite. fromWND: Only when opposing speech is banned can politically correct nitwittery prevail. fromWND: Harvard prof says group poses 'great danger to the American future'. fromPowerlineBlog: Video features the media's lowest moments of 2017 in a little under eight minutes. fromReason: If Americans want to bet on sports, the wise course for the government is to let them. Prohibitionists think gamblers squander precious time and money on a foolish fantasy they will never achieve. Well, look who's talking. fromDailyWire: Six new California laws (from the Democrat-controlled legislature) sure to make our lives just a little (or a lot) more frustrating. fromTheWashingtonExaminer: To promote one point of view and censor another is infringing on the freedom of speech for those of the opposite view – the exact oppression that our founders wished to prevent when they wrote the Constitution. fromLibertyPen/YouTube: Short excerpts of sterling insights from the brilliant and beloved American astronomer, cosmologist, astrophysicist, astrobiologist and author Carl Sagan. fromYouCan'tBreakMe: Excellent advice for a fulfilling life. from Creators: Though typical Democrats and Republicans do not have this leftist hate for our nation, they have been willing accomplices in undermining the most basic value the Founding Fathers sought to promote — limited government. from LibertyPen: From censoring speakers to squads of thought police: a look at the many tactics used to chill speech on campus. Excerpts from Tucker Carlson Tonight. from The FreeThoughtProject: An extensive survey of hundreds of adults across the United States has just revealed that the thing most Americans fear—more than anything else—is their own government. from Townhall: At last, a step in the right direction. from The Panther: Excellent article from a Chapman college student, who campaigned for Hillary, making the case for free speech to his fellow liberals. from Reason: It all started with President Woodrow Wilson a hundred years ago. from CNS News: Blazing Saddles could not be made today. Too many snowflakes might melt. from NY Times: So much more than the title suggests. A great article to explain how racism has polluted an otherwise worthwhile move to embrace traditional American principles. from Reason: An internet entrepreneur saved 20,000+ free online college lectures after the government declared them illegal. from Bloomberg: This makes sense -- but only in explaining where California's goofy Governor Brown gets his guidance.